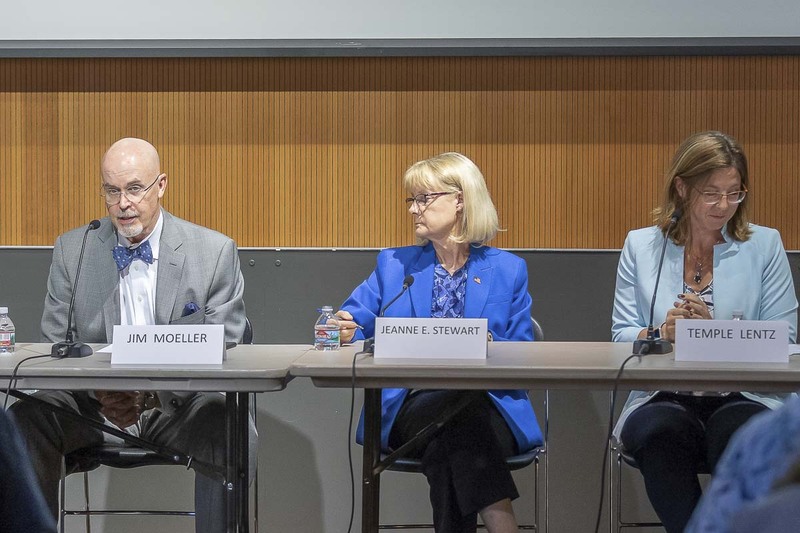 CLARK COUNTY — Three of the four candidates squaring off for Clark County Council’s District 1 seat squared off last Thursday at Vancouver’s Central Library. 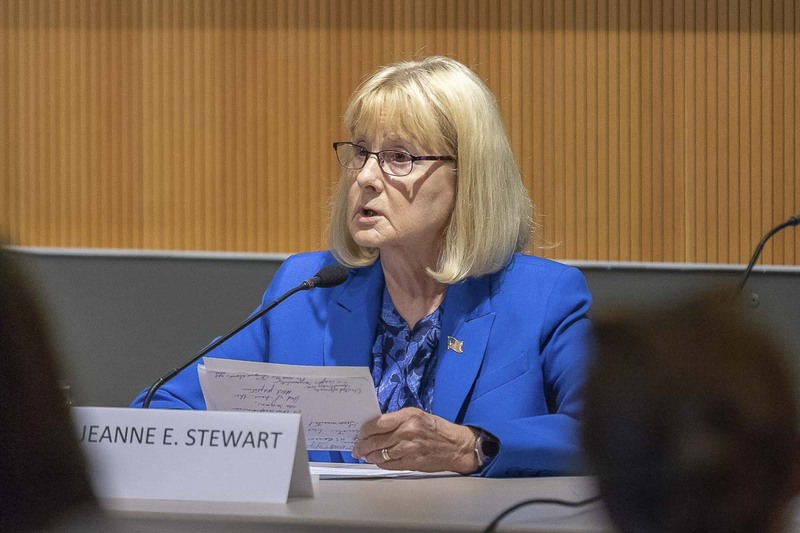 The forum, hosted by the League of Women Voters of Clark County, saw incumbent Jeanne E. Stewart, along with challengers Temple Lentz and Jim Moeller, face eight questions covering topics such as affordable housing, mental health, prison overcrowding, civility in government, and much more. Stewart, who was a Vancouver city councilor from 2001 to 2013, is looking for her second term on the county council. She identifies as a Republican, while Lentz and Moeller are both running as registered Democrats. Stewart last won before the new Home Rule Charter, which Lentz helped to craft, went into effect. She’s now facing the prospect of re-election in the county’s most liberal district, which covers much of downtown Vancouver. Lentz, as mentioned, helped to guide the Clark County Charter as a freeholder, and also has spent time as a precinct committee officer. She currently chairs the Clark County Commission on Aging, and works as business director for the Heather DeFord Group at Cascade Sotheby’s International Realty. Lentz has been leading the fundraising so far for this race. According to data from the state’s Public Disclosure Commission, Lentz has raised over $33,000, outpacing any other county council candidate. Stewart has reported only $1,100 in donations, while both Moeller and Veny Razumovsky have not reported any campaign contributions. Moeller was in his third term as a member of the Vancouver City Council when he stepped down in 2002 to become a state legislator. He was a member there until an unsuccessful bid to unseat Republican Jaime Herrera Beutler for Washington’s 3rd Congressional seat in 2016. 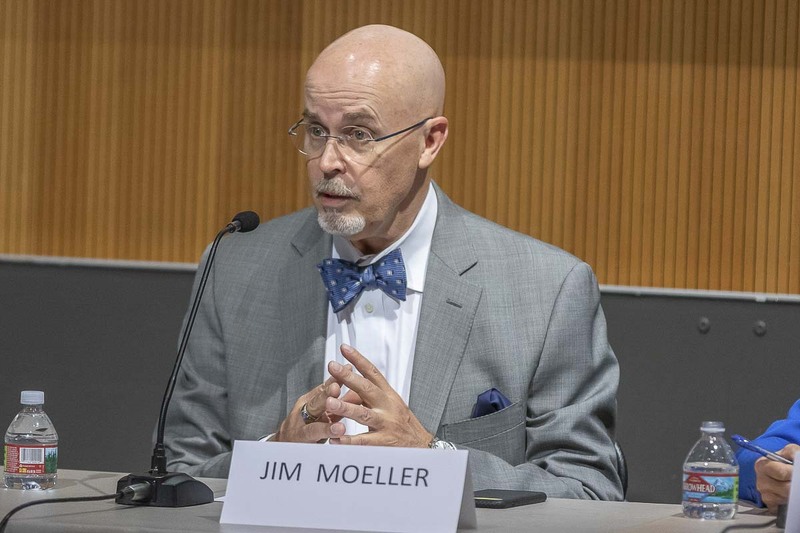 Moeller, who seemed to struggle with answering many of the questions within the time limit, went public with a diagnosis of Parkinson’s Disease last May. “I have a disability — an illness — but I am not disabled,” Moeller told the audience. He said the neurological disease does make it more difficult to put a voice to his thoughts, but has not impaired his judgement or ability to do the job. Razumovksy, a former Marine and IT specialist, is a fourth candidate in the race. He identifies as a member of the CascadiaNow party, though he has not run an active campaign and was not available at Thursday’s forum. Following is a sample of some of the questions asked of the candidates, and their answers. You can view all questions and answers at the video below. Temple Lentz — “There’s a possibility of fee for service. Currently a number of the services that are provided do not bring in the revenue that they actually cost. It costs us more in the county to put them out, than we charge. And while that’s good and wonderful that the county subsidizes a number of things, we also do need to think about the fact that, if we are offering a service, are we charging what we need to in order to continue to provide that service as effectively as possible?” — Also need to explore more public/private partnerships, and, if the ban on marijuana in the county is overturned, make sure any revenue goes to public health.